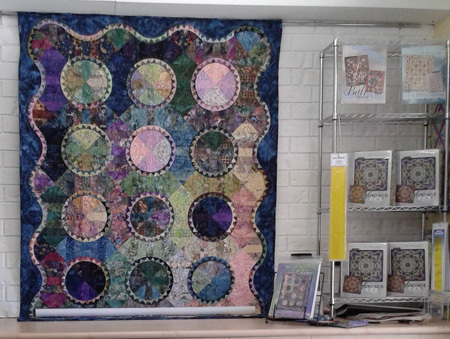 Ideally located at the top end of Ireland Street, in the picturesque town of Bright, in north eastern Victoria, Sew Bright Alpine Quilting stocks a fantastic range of international fabrics, patterns, kits and all sorts of gadgets, gifts and gizmo’s. The store is spacious and bright, with plenty of room for classes, workshops and get-togethers for quilters to exchange ideas. Angela Bradbury, the owner of Sew Bright Alpine Quilting has been quilting for more than a decade, with more than 30 years sewing experience. Working at a variety of Bright retail outlets, she always dreamt of opening a store to provide locals with an extensive range of products and to cater for the influx of tourists that visit the beautiful region all year round. Sew Bright Alpine Quilting is a welcoming haven for all and with workshops designed specifically to suit all participants, Angela can even create a weekend getaway package for visitors and their friends. Listening to what people want and continually expanding her range of products to delight her customers, Angela loves sharing her knowledge and passion of quilting to enable the craft to grow and thrive. With online shopping now available, plus a mail order service for customers, Sew Bright Alpine Quilting is a one stop speciality shop for quilters. Offering unusual textile art supplies, creative freestyle machine quilting service and made to measure dressmaking and alteration service, this store is where you can share your passion for quilting and sewing. Next time you’re in Victoria’s Alpine High Country call in to Bright, and make sure you visit Sew Bright Alpine Quilting – you simply can’t afford to miss it! In November 2012, Angela undertook training with Judy Niemeyer of Quiltworx.com to become a certified quilt shop. Quiltworx certified shops have exclusive selling and teaching rights over certain Quiltworx patterns. Angela is passionate about teaching the art of paper piecing and will be stocking many Quiltworx patterns, doing in store demonstrations, conducting Technique of the month classes, and assisting customers in fabric selection. The first exclusive program for Australian certified shops is the Glacier Star quilt, which is now available. Click here for more information. There are approximately 30 Quiltworx certified shops in Australia. Glacier Star, Quiltworx.com, Made by CS Sew Bright Alpine Quilting. Robin Beaver Batchelor Did the instructions make it easy to pick out the colors or was it confusing? Split Log Cabin, Quiltworx.com, Made by CS Sew Bright Alpine Quilting. Laura Middleton where is this pattern please? Cactus Flower Table Runner, Quiltworx.com, Made by CS Sew Bright Alpine Quilting.